Baze Reviews - Is it a Scam or Legit? Baze uses at-home blood testing to identify your nutritional deficiencies, creates a customizes plan based on the results, and sends you monthly vitamin shipments to optimize your health. After undergoing a simple, painless blood test at home, Baze uses MIT developed technology provided by third-party laboratories to identify potential nutritional deficiencies. Together, the website advertises Baze can help ensure you’re taking the right vitamins (along with the appropriate dosages), getting nutrients in a readily absorbable format, and always remain "in the optimum zone" for each vitamin—all in an affordable, transparent, and convenient format. As consumers, this leaves us with two core questions: 1) Is it necessary to optimize your nutrient levels in the first place, and if so, 2) is going through a supplement subscription company like Baze necessarily your best option? Let’s find some answers by starting with the basics. How Does the Baze Process Work? After signing up for an account and choosing your product or service (more next), Baze will mail a simple blood test to complete in the comfort of your own home. The website indicates detailed instructions are included, although in general, you’ll want to collect your sample in the morning before eating or drinking (water is the exception). After collecting the sample, you’ll place it in the included postage-paid envelope and mail it to the company within an hour of testing. The remainder of the materials can be discarded in the trash. Overall, the process shouldn’t take more than 10 minutes. After receiving, Baze indicates that they assign your sample an anonymous number to protect your privacy before sending it to their “certified laboratories where it gets analyzed for your nutrients.” They also use end-to-end SSL encryption, and all their servers are protected using industry-leading security measures. It typically takes two weeks to receive your results, although this timeframe can vary depending on demand. A “continuously updated feed that keeps you informed of the most current scientific research in the field of nutrients and wellness." Based on the results of your lab tests, along with the company’s proprietary algorithm processing, Baze will recommend a mix of different nutrients that focus on the nine critical areas of your life: Bones & Joint, Brain, Energy, Hair, Skin, & Nails; Immunity, Libido & Fertility, Longevity, Sleep & Stress, and Strength & Endurance. With these details in mind, Baze emphasizes that all of their supplements are GMO, gluten, lactose, and artificial flavor-free, feature high bioavailability, and are made in the USA. How Much Do Baze’s Supplements & Testing Services Cost? All orders come with free shipping and a 90-day risk-free trial. After this point, their website emphasizes you can cancel your monthly membership at any time. After canceling, you'll retain access to all your data in the app, although you can contact support and have this information permanently deleted. They can be reached at hello@baze.com or (+49) 30 35 51 73 00. After a brief online search, we encountered dozens of traditional vitamin testing services, which required a lab visit and waiting several weeks to get your results. In many of these instances, a doctor’s orders were required. 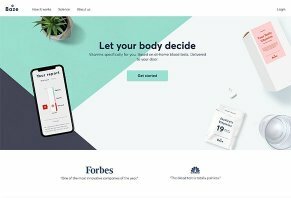 We also found a couple of third-party companies that offered customized vitamin pack deliveries (Care/of, VitaminPacks.com), although their recommendations were based on questionnaires, not at-home blood testing. And none of these options provided in-depth reporting accessible online or via an app. Given their distinctive differences, does this necessarily mean that Baze’s testing and subscription services are right for you? Bottom Line: Should You Become a Baze Customer? First, any time you’re dealing with something that can impact your health—supplements included, it’s always wise to speak with your physician before making a financial commitment. Not only can they help you make scientifically sound decisions based on your diagnosis, but they could also help you avoid potential side effects and medication interactions. Next, as we learned when writing Do You Need to Take Vitamins or Dietary Supplements, many professional medical organizations (the National Institutes of Health, Nutrition.gov, and the American Academy of Family Physicians, to name just a few) recommend that unless you’re deficient in the ingredients they contain, vitamin or mineral supplementation isn’t generally recommended. Along these same lines, we also learned that according to the Centers for Disease Control’s 2012 Second Nutrition Report, Americans are most deficient in vitamin B6 (about 10.5% of the population). This is followed by vitamin B12, vitamin C, and iron at between 2-8%, while less than 1% is deficient in vitamin A, vitamin E, or folate. In other words, while the Baze website frequently emphasizes that nine out of 10 Americans are deficient in at least one essential nutrient, the only support provided is a report titled “What America's Missing: A 2011 Report on the Nation's Nutrient Gap,” which was funded and created by the Milk Processor Education Program Dairy Research Institute. Returning to our dietary supplement article, we also learned that if your doctor diagnoses you as deficient in one or more areas, they’ll often emphasize that obtaining vitamins and minerals from food-based sources is often preferred to supplementation. With these important caveats in mind, between their blood deficiency testing, app-based customized reporting, and monthly vitamin deliveries, Baze seems to provide a unique service not currently offered by any competitors. And they stand behind their services with a 90-day money back guarantee, so you might not be out a more than a bit of your time if you end up dissatisfied. >> Read next: Pros and Cons of an At-Home Genetic Test: Should You Try It? Write a Review for Baze!